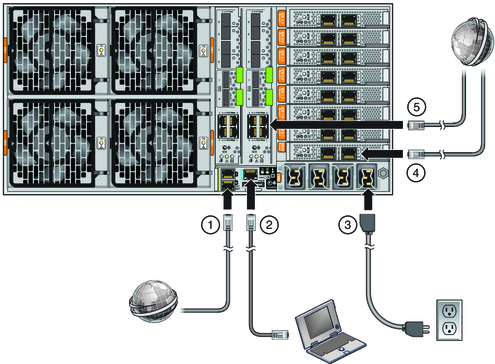 The service processor module (SP) provides connections used for system administration. These include serial and Ethernet cables for Oracle ILOM, and serial, video, and USB cables for the host console. Connectors are provided on the SP itself, and on the multiport cable, which connects to the SP. Connect an Ethernet cable between the NET MGT port and the network to which future connections to the SP will be made. NET MGT port 0 is the suggested default. Connect a serial cable between the SER MGT port and a terminal device or a PC. You might need an adapter. The server comes with a DB9-to-RJ45 serial port adapter. The SER MGT port provides a direct serial connection to the SP. You can use this to discover the SP’s IP address, and configure it if necessary. DHCP is the default, but you can configure it to use a static IP address as well. Once you know the SP’s IP address, you can use a web browser or an SSH connection to communicate with the SP over the NET MGT port. Alternatively, you can continue to use the serial port to communicate with the SP command line interface (CLI). Refer to the Oracle Integrated Lights Out Manager 3.0 documentation for details. Connect the multiport cable to the KVM connector. 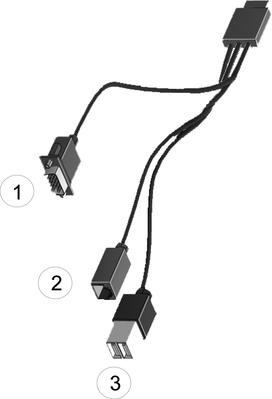 This cable provides connectors for the serial console, the video console, and USB. Connect power cable to power source. 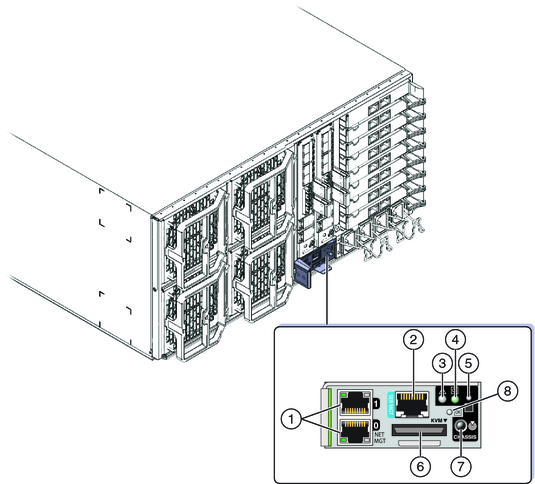 EM slots – see Cabling NEMs and PCIe EMs. NEM slots – see Cabling NEMs and PCIe EMs.